With this week’s Daredevil #11, the Omega Effect cross-over comes to an end. And, it’s not an altogether satisfying one, I’m sad to say. After the first panel below, I’ll get into some of the details of why this issue failed to fully deliver, but since that involves giving away the ending I’ll try to keep the first couple of paragraphs spoiler free and focus on the things I did like, leaving the rest of the post for those of you have already read this issue (or who don’t intend to for whatever reason). You’ve been warned, moving on. If we look at this entire event as just a character study, or as a means of getting from A to B, where neither one of those points matter nearly as much as the journey itself, I have very few complaints. On the contrary, this has been a great way to showcase all of the players while keeping their interactions in character and tremendously enjoyable. I’ve gotten many laughs out of these three issues, including Daredevil #11. Also, focusing specifically on Matt Murdock for a moment, I am still convinced that Mark Waid is a natural when it comes to channeling our main character and that he has a profound understanding of what makes Matt tick and how he views his bigger mission as a superhero. Mark Waid has delivered top notch character work for twelve issues straight (including Daredevil #10.1), and that stretch continues here. It’s been a consistently fun, and engaging ride where we’ve had the chance to spend time with tremendously well-written characters. However, it pains me to see the great build-up we saw in Avenging Spider-Man #6 and Punisher #10 come to such a needlessly anti-climactic ending (see below). The art is, once again, nothing short of amazing with great action scenes and interesting perspectives. Marcho Checchetto has a real knack for creating a sense of space and depth that pulls you into the scene, whether the panel has a wider scope or features a more intimate moment. The art has also been consistently clear and easy to follow which has been very beneficial to this story with its many different players and series of twists and turns. When it comes to the colors, Matt Hollingsworth brings his A game, in characteristic fashion. I actually found myself admiring the nuances of a brick wall. That’s saying something. So, with all the great art, great character work and entertaining dialogue, what about this issue leaves me wanting something different? Or at least something more? Well, the way this story wraps up, it feels like being in the middle of a movie only to suddenly see the director walk on set saying “Okay guys, that’s a wrap,” and then watch the actors look at their watches and decide it’s time to go out for pizza. Frank Castle is seen uncharacteristically shrugging off the fact that nothing went like it was supposed to and patting himself on the back for giving it a try. 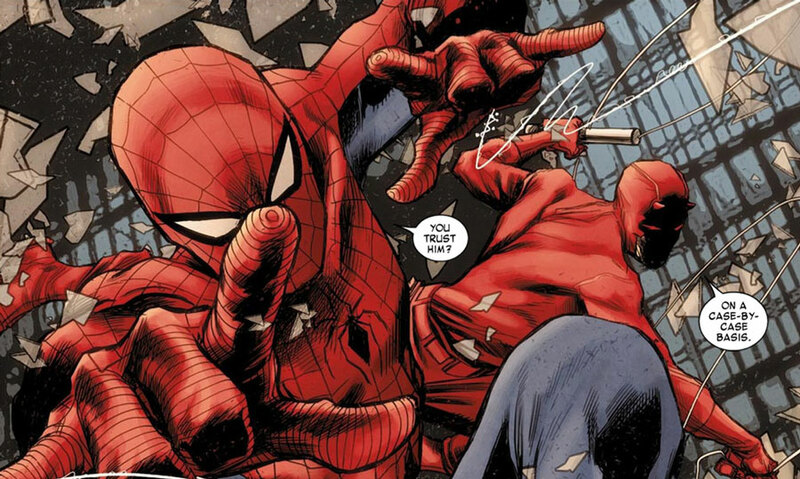 Spider-Man is asking Daredevil to agree to hand over the Omega Drive, but doesn’t seem to care much one way or the other, while Daredevil finds himself exactly where he started. Which, incidentally, is an even bigger problem with how this ends up than having it seem too sudden and inconsequential. We end up with Daredevil in almost exactly the same position as where it all started. A good story can – and should – be as much about the journey as the destination. (Incidentally a point I will be making in my long overdue Daredevil: Season One review which I hope to get to over the weekend.) But I think most people went into this event expecting the balance of power to look slightly different at the end of the story than at the beginning. This doesn’t mean that I was expecting a definitive end to all things Omega Drive-related. On the contrary, we know from solicitations of upcoming issues that the ramifications will be felt for quite some time. However, I don’t see why Matt still being in possession of an intact Omega drive is required for there to be long-lasting consequences. Simple vengeance, or even just suspecting that he has a copy of the information, would have sufficed. The way it all happens, the story manages to feel both too neatly wrapped up and frustratingly unresolved at the same time. The criticism often leveled at cross-overs is that they are too often about rounding up a group of heroes just for the sake of putting them in a story together, where the story becomes nothing more than an alibi for doing so. With the Omega Effect, we had something very different going: a collaboration that felt organic, and which grew naturally out of a story that had been brewing in Daredevil for quite some time. 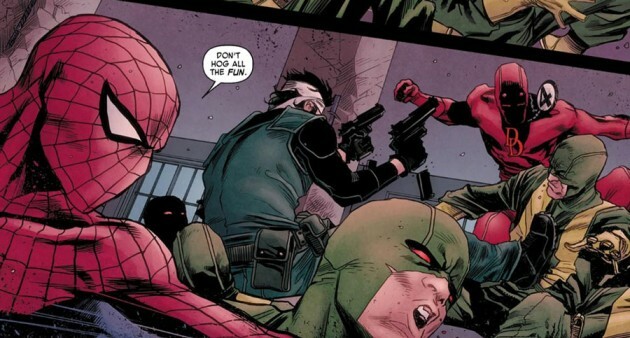 There were also hints along the way (based on interviews with the writers) of the fall-out of the event affecting both the Daredevil and Punisher series in the coming months. Why, then, with everything going for it, does this story inexplicably end up giving this reader the feeling that the Omega drive was nothing more than a plot device to get these characters to team up? Yes, it was fun. Despite the destination leaving me cold, it was a fun ride getting there. But it feels as if there was so much potential for something more substantial. Oh well, I will happily be re-reading this story for the humor, the many great character moments and the gorgeous artwork. As far as the rest goes, well… I’m looking forward to the complete change of pace of next week’s Daredevil #12. Very much agreed, Christine. Waid’s got pitch-perfect characterization and the artwork is great, but it wasn’t much of a story, was it? What changed, exactly? Punisher goes back to doing what he’s doing(and seeing that Cole is in the solicits for July, apparently their relationship is still in-tact), DD goes back to doing whatever with the Omega Drive like he was before, and Spider-Man…why was Spider-man even here!? Everything from the beginning of the story is pretty much exactly the same as the end, ‘cept now they beat up some faceless goons. I really enjoyed reading your review. Many of the points that you expressed are exactly the way I feel. I really do want to point out however that Marco Checchetto was truly amazing in this crossover. I am holding out hope that this story is going to lead to much bigger things. If that is true than I will be satisfied. Just on principle, it does not bother me when a story leaves the heroes in the same position as they were when the story started. That covers probably 90% of superhero comics after all. But, when the position they started is so utterly silly, it’s awful. Will Matt finally just give the drive to Reed Richards and end megacrime? And if not, were we ever given a reason that this wasn’t his first option? First off, I never picked up the tie-ins for this. I did skim the previous issues of this event at the shop and felt comfortable that I wouldn’t be lost by just getting this one issue. However, I was almost tempted to buy those issues simply for the art alone. Something about Checchetto has changed since the Shadowland era and I love this artistic evolution. Second, I think seeing the cover to DD #13 before reading this, sort of set my expectations that no significant resolution was going to occur here in this issue. I think Arron’s comments above are quite true when discussing superhero comics. But… a part of me holds Waid and Rucka in a class above the ordinary writer of comics. I wanted to believe that a payoff could occur here. It didn’t happen and I (somewhat sadly) feel a relief in that I didn’t buy those two other issues to this story. To clarify regarding ending up in the same spot, I mean this in a more narrow sense. Of course most comics end with the main players still in the same position in a larger sense. 45 years later, Matt still goes to his law office every morning where he meets Foggy and so on. But what usually happens is that there is more of a resolution at the end of the story. Like CBL said above, it was clear that this wasn’t the end to everything connected to the Omega drive, but I fully expected the pieces on the chess board to have moved around a bit going forward. Also, I think I would be less bothered by how things ended up if the ending hadn’t felt so abrupt. There’s also the problem Aaron K points out in that the longer this plot thread is kept going, the more flawed Matt’s logic becomes when it comes to his decision to keep the drive. Agreed, agreed, and agreed, Christine. I just put down Daredevil #11 after my first read, and my immediate reaction was, “What the hell was all this FOR?” The drive is still in the same hands, a bunch of disposable thugs have bruises, and there might (might!) be a change in the character of the Punisher’s sidekick in a title I don’t read. I loved the ride–well-written, with art good enough that I noticed the art–but I’m vastly irritated that it didn’t take me anywhere. I picked up Avenging Spider-Man and Daredevil #11 at the same time, but my local shop didn’t have the Punisher issue, and now I’m not going to bother hunting it down. SO disappointing. Argh. That said, I did laugh aloud when Daredevil told Cole to go to Avengers Mansion and throw a stick. Matt doesn’t always have his head on straight, but I’ll give him points for perspective there. I agree with the majority of people here who were slightly disappointed with the ending to The Omega Effect. However, with the artwork being as gorgeous as it was, and the dialogue being as sharp as it was, I found it really hard to walk away feeling anything but warm and fuzzy. I just hope Waid either starts delivering on this omega drive story soon, or that he abandons it and focuses on something else. I would love to see a character from any one of the megacrime organizations introduced and developed as a legitimate villain for Matt Murdock. Right now, it feels like he’s being put up against faceless nobodies. Where is the threat? @Alex – You raise a good point that I hadn’t really considered before. It’s surprising how enjoyable this comic arc is given how weak its villains are. While they sound intimidating when referred to as “megacrime”, they’re all portrayed as basically incompetent simpletons. Indeed, they even engage Daredevil in hand-to-hand combat! When has A.I.M. not had a superweapon ready at hand for such a purpose? Or HYDRA? It’s hard to read about these same organizations taking on the Avengers in one place and losing to Daredevil, Spider-Man, and rubber bullets in another. The whole premise for months now that Matt’s friends are safer because he has the Omega drive rather than giving it away to Shield or the Avengers and shouting from the rooftops that he doesn’t have it anymore is just silly. Once I accepted that, I was able to let myself be pulled along for the ride. I have to say I’m getting mightily tired of the relentless crossovers, and I’m considering dropping DD on a monthly basis and going back to trades. I’ve nothing against Spidey and Punisher but they are not books I read, and I do resent being expected to buy them to be able to follow what’s happening in my favourite book. I do understand that Marvel is a commercial operation and it’s in its nature to fleece the consumer for whatever they can get, but it’s getting to feel a bit grubby to me. Not sure I’m going to bother from #12 on.